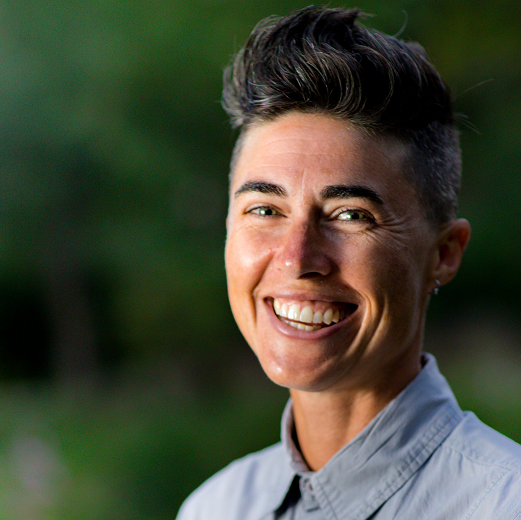 This description of Katrina Spade's work was prepared when Katrina Spade was elected to the Ashoka Fellowship in 2018. The U.S. funeral industry is toxic, dehumanizing, and disempowering. And the way many people think about theirand their loved ones’ deaths is as well. Katrina is building a more enlightened, humane, and environmentally-friendly deathcare sector, in part by creating and championing a system that will gently return human bodies to the earth, and in general through encouraging participation, transparency, and meaningful human interactions throughout the process. On the one hand, Katrina is transforming the funeral industry. For the first time in nearly 60 years, Katrina’s model for human disposition based on natural biological processes represents a new (and far more environmentally friendly) option for our bodies after death. Embalming plus burial and, more recently, cremation, are not only costly and environmentally un-friendly, but Katrina believes that these options as currently offered contribute to a disconnect between life and death and to the fear and alienation that people (and their loved ones) feel at the ends of their lives. Her novel solution transforms our dead bodies into a final act of giving, metaphorically speaking, and, literally, into soil. Simultaneously, Katrina positions this new choice and its attendant roles and rituals as a driver of a shift in expectations around the way we all experience end-of-life options. Through Recompose, Katrina braids together the work of transforming an industry and transforming a culture. She is simultaneously working through the technical, political, economic, and cultural systems to usher in this new option, and with it a more relevant and responsive deathcare industry. Technically, she’s finalizing with Washington State University the clinical trials of her pilot with donor bodies. Legally and legislatively, she’s starting the state-by-state process to create the conducive operating environment. And culturally, she’s leading the national conversation around these issues, having been featured in hundreds of media pieces, articles, documentaries, and books around the world. By designing the process, physical structures, and spaces with a keen eye to the participation of family members and the involvement of “death doulas”, various roles that will take this model to the masses (and the economics of these roles) are coming into focus. And all the while, the cultural shift she’s driving towards is becoming realized, as people around the world expand their imaginations of what their bodies can contribute to even in death, and become more involved and engaged in their (or their loved ones’) last acts on earth. When it comes to what happens to our bodies after we die, our current models align more with the desires of today’s funeral industry than with individuals or the loved ones they leave behind. The funeral industry is $20-billion-dollars-a-year-large and, as Katrina points out, “depends on the sale of consumables to vulnerable people” while pushing products and deploying tactics that disempower families. The industry is not immune to change; it’s just inclined to only change only when it wants to, and for the most part resists outside influences. A good example is cremation, which has risen as the disposition option for just 3% of bodies in 1960 to 50% this year and is on track to break 75% by 2030. As Katrina points out, this major shift is not a response to people’s affinity for fire or particular inherent meaning and beauty in this practice, but because people perceive it as cheaper, simpler, and less prone to upselling from industry members. Cremation is also often mistakenly sold as being more environmentally friendly than burial, which with its use of formaldehyde-based embalming fluids and concrete casket liners is costly and toxic. (The fact that embalming is a regular procedure only in the US and Canada is another example of the industry’s effective lobbying and marketing efforts, these in the name of public health.) In reality, each year cremations in the US contribute 600 million pounds of CO2 (not to mention particulates like mercury) into the atmosphere. Changing this won’t completely heal our climate, but by making our final acts less harmful it could change our relationship with death. Katrina is working to simultaneously transform the funeral industry as well as to transform the conversation around death in the United States. By creating a viable, profound, and environmentally-friendly “third option” to compete with conventional burial and cremation, The model is demonstrating a real interest in alternative methods of disposition and more participation in our loved ones deaths, thus further encouraging an entrenched industry to change. Katrina understands that the power that this unleashes – a worldwide movement of people with changed expectations for their last acts on earth – is the only thing that can possibly wrest some control from today’s funeral industry. In a way, Katrina’s core “innovation” is not new. Based on proven models of composting livestock and meeting human’s deep need to attend to their loved ones even in death, her solution is a system that gently transforms bodies into soil, designed in a way that is participatory and meaningful to all people involved. In the Recompose model, bodies are lovingly placed in individual reusable recomposition vessels shaped like “extruded hexagons” - 6’ tall and 10’ long 6-sided cylinders. An individual’s body is then covered with woodchips, and the door is closed,, facilitating the natural transformation to soil thirty days later. Since this is a decidedly urban option (with green burials making more sense in rural areas), Katrina is building a flagship facility in Seattle and planning for the creation of hubs where a hive of recomposition vessels share space with areas for ritual and remembrance, and to be made available to the smaller and less-formal cottage industry of death doulas, hospices, and home funerals who have been up until now stuck working at the margins of existing, limiting options. Families can take home some of the soil created, and gardens on-site will perform the remembrance functions of cemeteries. The technical aspects are fairly straightforward and guidelines based on decades of work composting livestock are firmly established. Indeed, with regard to whole cow composting and the like, the practice is widespread; after a set number of days reaching a target temperature, the composted livestock has turned to soil and is safe to apply to fields. But this is new territory for human disposition. Luckily, the university that took the lead in setting these livestock standards is Washington State University. They are also the academic lead working with Katrina – and all the donor bodies to date – on establishing the human protocols. Once articulated, these protocols must become recognized by state legislatures as viable disposition options (as burial and cremation already are) so that families - the de facto “property owners” of their loved ones’ dead bodies - and practitioners are legally protected and recognized as complying with the state’s desire to ensure the public’s health. Since introducing this legislation is a state-by-state proposition, Katrina is working with a lobbyist and legislative expert to clear the path in Washington state, and then beyond. She’s worked with a legal strategist – a professor of law at Wake Forest University – to rank all states on the ease of state-wide passage. Washington is on the easier side, along with most other mountain west and rural states (in a way that seems to mimic marijuana legalization). Since building out and demonstrating this new process beyond the university campus required more funds than were available (of this nature) philanthropically, in January 2017 Katrina founded a public benefit corporation, itself called Recompose, to raise investment. The system itself is not prohibitively expensive and allows ample flexibility. Once they have opened their flagship facility they will generate operating capital through contracts with small and values-aligned providers, and by the spring of 2020 Katrina hopes to have landed on leasing models for scaling the actual offering to other cities. The strategies discussed so far help ensure that and new-and-improved option can compete technically, economically, and legally with other disposition options and – driven by demand - shake up the current funeral industry. A separate but related strategy is to change the conversation around death. Katrina deeply believes that the recompose solution is a great thing that should exist, but she also understands that its greatest impact to date might simply be in that it’s particularly potent as a way to draw people in, as evidenced by the 230 articles written about her and her work and more than 1 million views of her TED talk. Katrina is designing her solution, the way we talk about it, and even the way the facilities will be photographed and shared on platforms like Instagram as a way for millions of people to think about what really matters and - in engaging with those possibilities – change their relationships with death. Here, Katrina is careful to keep her sights on the end goal of greater participation and engagement across all final disposition options. This tide of greater expectations will also help green burial options and see more families more engaged in meaning making and connection, even around existing options. Of course, some of these systems – particularly embalming and cremation – have been designed with absolutely no sense that families might participate. The thought of accompanying your loved one’s body right up to the door of a stainless-steel oven feels jarringly wrong. But it’s this dehumanization, professionalization, and abrupt rupture that Katrina is calling into public consciousness as being inappropriate, through her model and her championing of the idea of a more transparent, participatory, and humane deathcare industry. Katrina understands that she won’t change the system at scale “just by existing.” That said, pilots, funding, partnerships, and plans underway in Seattle suggest that Katrina could meet up to 8% of the demand in the region in the next 5-10 years. Backed by a cost-effective and economically sound business model that appeals to customers but also to practitioners new and old in the deathcare field, she will then help new hubs get established in other states, and through all these efforts ensure a sufficient level of awareness of this option changes expectations around the country. Thanks to Katrina’s efforts, for the dying and their family and friends, the death and post-death process has the potential to change rapidly and dramatically. For folks for whom the recompose option is available, upon death they will care for their loved one’s body - likely in their own home - and then, when time to sit vigil with the physical body has passed, they will move to a private area of the Recompose memorial site. Recompose staff, community members, independently operating death doulas, or even staff of existing funeral homes may help facilitate the process, but the family members themselves will be leading, and will personally place their loved one into the Recompose vessel, then cover with wood chips. A month later, families may choose to return to the site to retrieve the soil. They will be encouraged to leave some - and to linger - in the memorial garden. People for whom the Recompose option isn’t immediately available, and who are perhaps learning about it in the news or via their social media feeds, will likely expect more of their own local death rituals. They will be reminded that it is legal (almost everywhere in the US) for a family member to act as the funeral director when a loved one dies, for the deceased to remain in the home for a period of rememberance and visitation, to host a home funeral, to seek out a green burial, to decline embalming, or even to build their own coffin. Though these alternatives come to life not just because of Katrina’s vision, they gain purchase when more and more people come to expect - and indeed experience - this heightened level of meaning making, engagement, and connection to death and what comes next. Katrina had an idyllic childhood growing up as the oldest child in a group of more than a dozen kids who lived at the end of a hill on the top of a dead-end dirt road. She naturally fell into the role of chief instigator of play (and also producer of elaborate theatrical productions and CEO of various summer enterprises). Coming out a queer in high school and growing into her own identity and politics – with a lot of encouragement from one particular radical grandma – helped her forge a strong identity and sense of purpose. And while she loved being raised in rural New Hampshire, around this time she also fell in love with cities. Katrina has been trained as an architect which allows her to “see the whole picture.” For her the key skill she’s developed is not just the big ideas, but the knowledge of all the things that need to come together and the skill to lead the necessary team-of-teams. In the case of a building, that means hiring a HVAC guy, trusting your structural engineer, and generally being less of an artist and more like a project manager. In the case of her work with the Urban Death Project and Recompose, that team includes funeral home managers, city planners, academics, lobbyists, as well as her close-knit queer community, many wise older women that Katrina has sought out as advisors, and enthusiastic supporters all over the world. As she was wrapping up her training, a series of personal events and up-close-and-uncomfortable deaths inspired her to take a close look at this major life transition. She initially conceived of the Urban Death Project, a nonprofit founded in 2014 to do research on, pilot, and promote the idea of a communal burial and human composting. For several reasons – communal burial being the biggest non-starter for most folks – she tabled this particular approach, and for her new pivot to get traction and to unlock funding, she re-launched as the public benefit corporation Recompose in 2017.